Includes the 7/8" post clamp. 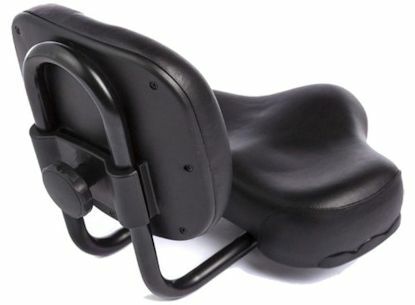 Mounts with standard rails - Fits on Standard Seat posts. Base: 11 inches Wide by 10 inches Front to Back. Back: 7 inches wide by 5 1/2 inches top to bottom. Add a Medium Gel Pad for additional comfort. 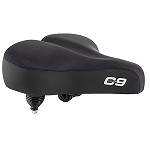 very good comfortable seat, back support is good , minor problem is the fact that it slips to the bottom-most position,despite tightening the plastic knob to hold it is the desired position. I found the seat to be unusable for two reasons. First, I could not get on and off the bike because the seat back was in the way when I tried to swing my leg over the seat. (This shouldn't be an issue with girl's bikes, but is with men's.) Second, the slightest amount of pressure pushes the seat backrest down to the lowest position, no matter how tightly I tighten it. I saw that another reviewer had the same problem, but another reviewer said he didn't, so I bought the seat anyway thinking it was just a one-time problem with that one persons's eat. It's not. 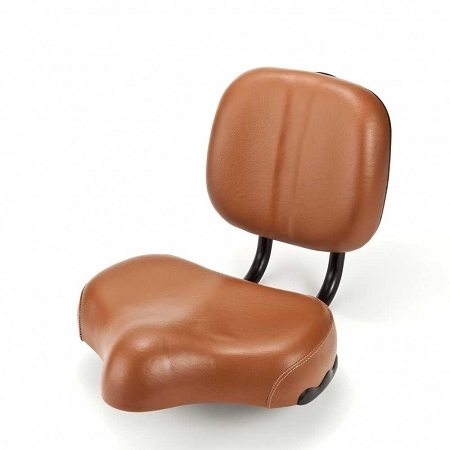 This replacement seat to go on our stationary bike has worked out to be just great! The gentleman from customer service was very knowledgeable about the products they carry and was very helpful in getting us just the right seat for our needs. I am very happy with the purchase and have not trouble with the saddle sliding down. It's firm on my bike and I love it. I love the seat it's a wonderful improvement over my old one. Quality and function are both just wonderful. Great seat with good back support. What a difference! 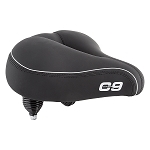 I love my new bike seat with the backrest! It makes me feel secure on my bike so that I can focus on enjoying the ride and not worrying about tumbling off! I love it...wonderful for those of us who are a little on the older side and need that boost of security! Excellent product. Can't say enough about how helpful customer service was, thank you.